ok I has done it by actully hitting the snakes (with inferno and blaze) untill they were half the way down or almost dead, and I got them with less than 10 nets, but I cnnot find the other things, the water (I had foun one) and the repair items, and the post don´t have the pictures anymore, so can you help me a bit? There are three Golden Ring Maps. 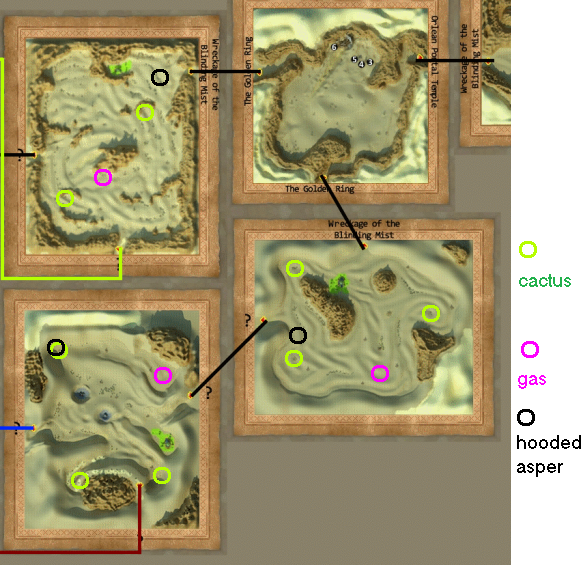 Each map has three cacti that might give water, one will for sure in each map. It is random, so you have to check each one, unless you get lucky. What server are you on? If you play Leonis, I can show you where they are. Edited by pdfisher, 19 September 2014 - 01:33 PM. What time will you be on? If you can, use server time. In the plans, but how long it takes to get another character to the right level...if someone else does it and gets the information it can always be edited in. Links were broken, either because the place they were uploaded to deleted them or the original uploader deleted them. manage to get through gates of muris, with a little help from my friends. These quests are extremely terrible and masochistic!!!! Random spawns? low drop rates of the quest item? A poor system of travel to make people just use teleport tickets instead? Can we simply assume we would get more of this in the future? I'm stuck trying to find Hooded Aspers for the "In Need of Food" quest, the worst of them all. The blasted spawn of them can either spawn around 8 different monsters , crowned aspers, hooded aspers, hooded asper hunters, hooded asper assassins, hooded asper leaders, etc. Of course only the normal hooded aspers drop the quest item. Can this be made less of an ordeal or would you leave players to deal with it until they would stop playing this game entirely? Edited by saravon, 13 September 2015 - 12:42 PM. Can this be made less of an ordeal or should you leave players to deal with it until they give up? I have to agree with you on this. I have taken hours to do this quest alone. It is always the worst one, and getting Hooded Asper Skins part is the worst of that quest. I realize the original intention was to make you explore Orlo. However forcing a person to work for hours, just for 5 skins is torturous. They could stand to tweak the drop rate on those things, or change it so that any Hooded Asper could give them. I marked some spots on the map if that could be useful. I think I missed a few spots. Hooded Aspers share the same spawn as around 8 different monsters so anywhere you see Aspers might be a place where they may spawn after you kill those Aspers. Edited by henrycao, 05 October 2016 - 01:43 PM. I did the wayfinder quest on 6 of my chars. Thank you for this guide and the images, it helped a lot. But now... after orlo update... do we still need this quest? You can find the quests here, there are also 3 quests in the sanctuary place that only give exp. Is this intentional, or something that got overlooked? As you no longer need the wayfinder skill/vizier key to acces muris & the golden ring. After getting to Orlo, which is already a pain, it's a pain to get through the quests. However the quests are fun and worth it. So here's some help. I figured the quests out and hopefully I can help out some others to finish it more quickly. Note: All monsters on Orlo are strong. I advice you party friends... or play your raider/scout and stealth your way through the maps. That being said. Here's how to get through the first quests. Note3: You NEED to have a Hebarn or Arua fate passive skill to activate and finish these quests. Right after you reach Orlo. Talk to the NPC awaiting you. She'll tell you to go to Dread captain Bruise. Double check you got the quest and simply go west (...that would be left, for you brainiacs out there). You should end up in the map called Wreckage of the blinding mist. Walk north and you'll find 3 NPCs, after that you'll see a crashed airship and on the other side is Captain Bruise. He doesn't trust you and will only trust you if his crew likes you. So you'll have to finish 3 quests of the crewmembers. You will have to get all these quest to be able to enter the Wasteland map!! You only need to kill 3 types of monsters. - Desert Asper -> Should reward you 12 proofs and 5 meats. - Hooded Asper -> 12 proofs and 5 skins. - Crowned Asper -> 12 proofs. The desert asper and hooded ones can be found everywhere. However the crowned are 'hard' to find. But not with my help!! Just keep walking WEST, through the Golden ring map. You'll cross a map without snake monsters, wasteland ruins path. Just keep moving west and you'll find 2 entrances. Both lead to wasteland maps. Both are different maps, but contain the same mobs. You'll find crowned aspers here. Move East to get back. Most annoying quest of all. Before we even start, here's a tip. If no one is around. DROP your nets (they are in your inventory/consumable tab). Talk to Ega and tell her you need more nets. She'll give you 10. This quest has 2 parts. 1. Catch 3 of those snakes. We'll start catching venomous hooded aspers. Go to the map south from the wreckage. After that, keep walking south again. Here's a pic of the coordinates and how the thing looks like. DO NOT FIGHT. Just throw a net. It took me 10 nets before I got my first proof. So it'll take patience. You just need 3 snakes and the first part is done. Keep moving west to end up in wasteland ruins path. From here you can go to TWO wasteland maps. The south map contains 2 EQ. The west map contains 4 EQ. You need a total of 6 EQ. It might take a while before you receive the quest item. Just keep walking around and keep trying. I know it's a pain. After getting these items. Head back to Dr. Ega and you're finished. Not too hard. Just have to keep walking around in the Golden Ring maps. Find 3 cacti to give you the items. After getting 3 of these things. You're done. After finishing all 3 quests. Head back to the captain. He'll say he'll trust you now and will reward you with 8mil exp and about 1mil zulies. You will also receive a special PASSIVE SKILL. However I'm not going to spoil what that passive skill is. I COULDNT enter Wasteland Ruins Path! So u MUST ask all 3 quests to be able to get to Wasteland Ruins Path! I've done all the quests and all I get now are recurring quests, like the karkian darkness etc. I've already done them all twice, is there any other quests? Errm... not at Blinding mist anymore. You could try the blackbear quests. There is a blackbear NPC in the 1st map, the one you arrived. Although I don't believe that quest gives you anything but exp. Can't remember exactly. These are all the quests on Orlo I know of. i cannot get quest from the three npcs in the golden ring.. whos npc should i talk to first? Which quest are you trying to get? I did another wayfinder quest last week with a new char. just running around on one map... The Golden Ring... and check all the cactus. There are plenty of them, so it does not matter, if some of them are dry. Fast quest. nothing changed... you still have to go to both Wasteland maps to get the 6 rewards. Catching the Venomous Hooded Aspers is not that hard. But you still need more than 5 nets. There are a lot of Aspers on the Golden Ring Map. No need to look for them any more. The quest rewards drop easily. Just the Hooded Aspers took me some time. I mean, it is still a hard quest... and it takes a lot of time to do the fate quest, the temple quest and the wayfinder quest. Just to get a useless skill and be able to do the next quests and get some doctor arms or asper charms... which could easily and cheap be bought on Junon market. The reward for the wayfinder quest should be a lot better.